"This is a unique and delicious way to use a few extra apples. With a loaf of fresh bread and a side salad, this soup makes a wonderful fall meal for family and friends." Melt butter in a stockpot over medium heat; saute onion until tender, about 10 minutes. Sprinkle flour and mustard powder over onion and stir to coat. Cook and stir onion mixture until flour and mustard have dissolved, 1 to 2 more minutes. Stir chicken stock into onion mixture until well-blended; add 3/4 the apples. Cover the stockpot with a lid, reduce heat to low, and simmer until soup is thickened and apple is tender, about 10 minutes. 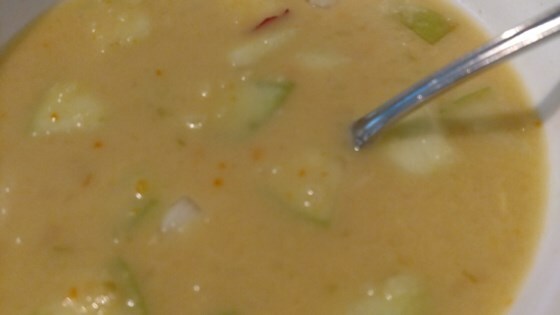 Stir Cheddar cheese into soup, stirring constantly, until cheese is melted and soup is a silky texture, 3 to 5 minutes. Blend soup using a hand blender or transfer soup to a blender, working in batches, until soup is smooth. Stir hot sauce and black pepper into soup. Ladle soup into serving bowls and garnish with remaining 1/4 chopped apple. You may substitute apple cider for up to 2 cups of chicken stock. Try to get a good quality sharp cheese. Cabot® makes a sharp Cheddar that works well. Any tangy apple can be substituted for Granny Smith.